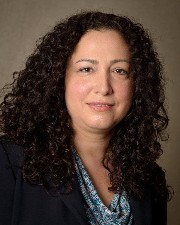 Maria Gutierrez (’91, M.B.A. ’95), a native Houstonian, is Manager of Tendering and Risk Assessment at Cameron Valves and Measurement, a company recently acquired by Schlumberger. She always has travelled extensively for her career, and now she manages teams responsible for strategic tenders in Europe, Asia and North and South America. As a single mother of two girls, she is constantly on the go. She still manages to travel the world with her family and recently returned from a one year stint in London. LUNAR COUGAR: Where are your favorite places to travel? MARIA GUTIERREZ: My favorite place to travel is Voghera, Italy. I love the laid back attitude and the food there — the pasta, fish, bread and cured meats are all so delicious. The Plaza is in the center of the village and people will just be sitting out, relaxing and eating and drinking at night. It is so beautiful. I also like visiting Kuala Lumpur in Malaysia, but the flight there is so long! Can you remember an “epiphany” you had while studying at UH? I went to college on a scholarship and I lived on campus, away from my family for the first time ever. I remember I had always had all A’s in my high school classes and then in my first semester at college, I got a C in Political Science. I realized college was harder than I thought, and it really served as a wake-up call for me. I put in even more effort, though, and never got another C after that! How did your education at UH shape your life? Living away from my family taught me independence. I also think that going to college in general helped to teach me discipline, how to better manage my time. I was also able to intern for Shell during my undergraduate courses and that gave me real life business experience that was essential in readying me for a career in the oil and gas industry. Did you have a favorite professor or class at UH? I had a very interesting history professor during my undergraduate studies. He told really good stories and challenged me and what I thought I knew to be true. He always told us not to just accept what history books taught you in the past. That was a great lesson. What was the most enlightening or influential research you participated in on campus? A marketing class I took during my M.B.A. program had us work from real-life business models. For instance, we had to study the feasibility of Taco Bell, KFC and Pizza Hut all streamlining their brand when they were acquired by Pepsi. And now you see these restaurants everywhere — all in one building. But we were doing the actual research, determining whether it would work or not! It was difficult juggling a fulltime career and going back for a graduate degree, but projects like that one really made the coursework come alive. What advice do you have for current UH students? Business is competitive nowadays. I would encourage students to network while they’re in undergraduate courses and join some clubs. I belonged to the Hispanic Business Students Association, for instance. Students should try to get internships and expose themselves to corporate America so that when they graduate and start their career, it isn’t such a shock. Why is it important for women to “go into” business? Women are definitely underrepresented in the oil and gas industry, but I believe it is important for women to work in the industry because we offer something different, a different point of view. I would recommend that women interested in becoming business leaders should seek out women’s business organizations that give women a “leg up” in corporate America. There are a lot of programs that you can apply to that help women climb the corporate ladder, and I would do some research in your discipline and find some of those organizations. What do you like best about the city of Houston? I love my neighborhood of Lindale. It has the best Mexican restaurants and meat markets. I also love walking in Buffalo Bayou Park, near Allen Parkway. My girls and I travel! When we were living in London last year, I took them to Prague, Vatican City, Paris — every weekend we would take little trips. And I took them to Limerick, Ireland, to visit the place they were born. What do you think about the campus and UH’s newest initiatives? UH is doing new scientific research and becoming more internationally known. I feel like as an alumna, my degree is held in higher regard — it’s more substantial. In fact, I’ve been thinking I want to buy UH plates for my car! I want to show how proud I am to be a graduate.